Paratrechina longicornis is also called as the Black Crazy ant as they are fast and dash around erratically almost as if going crazy. They are thought to be one of the most widespread species in the world, occurring both indoors as well as outdoors. Indoors, they are equally at ease in homes and in commercial establishments, displaying remarkable ability to adapt to new habitats and out-compete other species of ants. They are now considered an invasive species and as pests. They build their nests in places ranging from loose bark, in rotten wood, under logs or stones, among rubbish, stacked newspapers or books and under undisturbed debris inside buildings. They also feed on everything from insects to sugar and plant secretions, fruit and a range of household scraps. 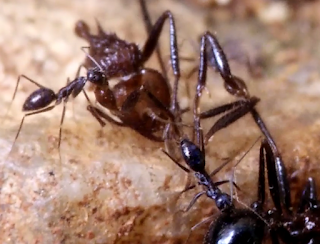 The workers cooperate to lift heavy prey and other food, which is carried back to their nest. Here I have captured some footage of the workers lifting heavy material and carrying it back to their nest.